Ben Simmons has celebrated in style after being named a NBA All-Star for the first time, leading Philadelphia to their first win in six years over Golden State. The 76ers snapped a 10-game losing streak against the Warriors dating back to March 2013 with the 113-104 triumph in Oakland. Second-year star Simmons had a superb all-round game on Thursday, tallying 26 points, eight rebounds, six assists and three steals. "I try to stay calm and try to stay composed," he said. 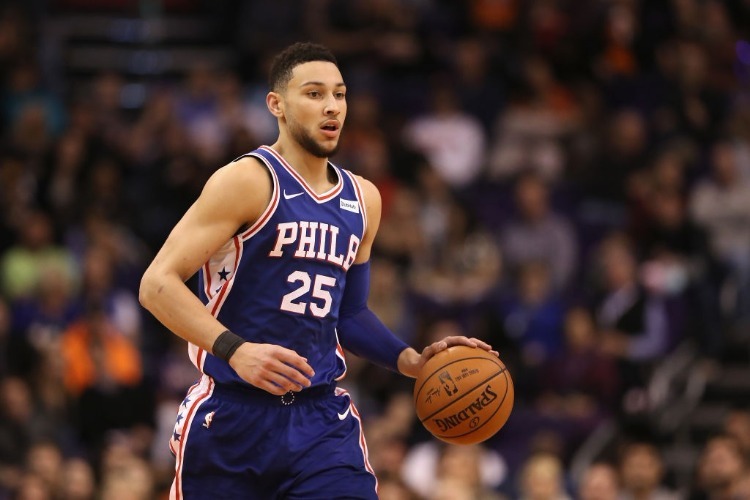 Earlier in the day, Simmons was included on the bench in the Eastern Conference team for the February 17 All-Star game in Charlotte. The 22-year-old Australian was controversially overlooked for an All-Star berth in his rookie year, but was impossible to ignore this time. "It's just being more confident and trying to expand my game," he said after the win over Golden State. "Taking care of the ball - that's about it; just getting comfortable." Superstar centre Joel Embiid also had a huge game against the Warriors with 26 points and 20 rebounds, while Australian Jonah Bolden continued his impressive rookie campaign with eight points and five rebounds off the bench. "It's a fantastic win. This group - myself included - we have not beaten Golden State," 76ers coach Brett Brown said. Stephen Curry had a game-high 41 points, including 10 three-pointers, for the Warriors, who lost for the first time in 11 games. LeBron James made a triumphant return after being sidelined for 17 games with a groin injury, racking up 24 points, 14 rebounds and nine assists to inspire the Los Angeles Lakers to a 123-120 overtime derby victory over the Clippers. The Spurs had six players in double figures. Giannis Antetokounmpo scored 19 points and Khris Middleton had 18 as the Milwaukee Bucks beat Toronto 105-92, ending the Raptors' season-best home winning streak at 10 games. Andre Drummond had 24 points and 20 rebounds and Detroit rallied from a nine-point deficit in the fourth quarter to beat short-handed Dallas 93-89. Before the game, the Mavericks traded Dennis Smith Jr, DeAndre Jordan and Wesley Matthews to the New York Knicks in a seven-player deal. Dallas acquired Kristaps Porzingis but, for this game, the Mavericks were significantly undermanned as they were also without rookie Luca Doncic (ankle). Australian Ryan Broekhoff had seven points and three rebounds for Dallas. The Orlando Magic beat Indiana 107-100 in what was a fourth-straight loss for the Pacers.